The serial project of Dead Set exists as a sequence of notes : each part consists as an assemblage of modular concepts, that are rearranged for the duration of the individual spectacle. Dead Set #2 and #3 were organized around the topic of the image of trauma. 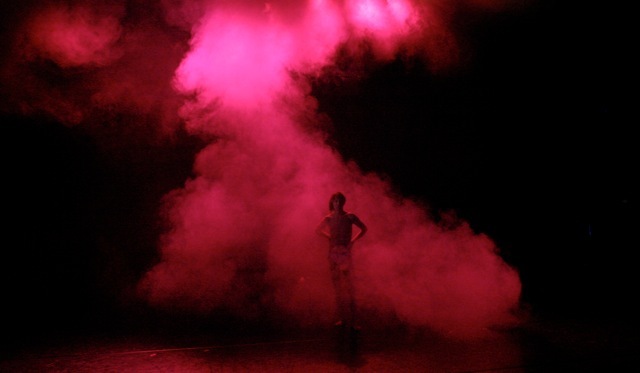 Dead Set#2 was created first in Berlin at the Hebbel Theatre and for Paris at the Festival d’Automne à Paris. Further iterations of the series will involve non-theatrical performances, straight-to-video releases, and commerce. Dead Set #2 and #3 contained the following modules. 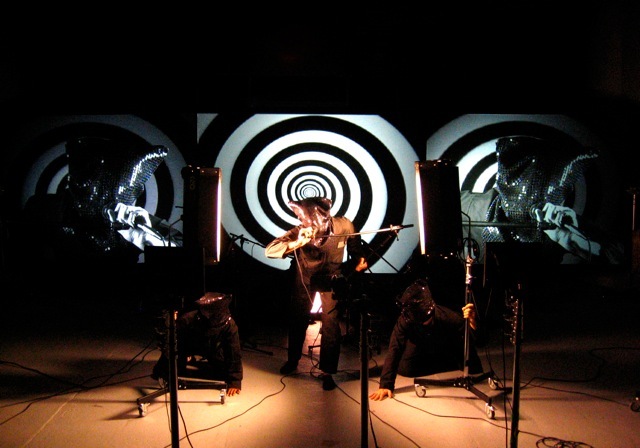 Each module was arranged in sequence for a performance, but no announcement of module was made for the audience, instead the performance segued from one section to another. Color Therapy – on 4 video screens arranged in a cross, colors associated with sine wave tones fade in and out. Chromotherapy has been explored as an alternative medical treatment for post traumatic stress disorder. Flash Poetry – An edited conversation between a cannibal seeking a victim and a victim seeking a cannibal culled from archived chat rooms were animated on 4 video screens, set to audio pulled from youtube first person recordings of mercenaries in the Iraq and Afghanistan. Because the recordings were not American military, it seemed they were not censored and provided the first unedited video recordings of war. Repro Trauma Fiction – Ensemble members donned flight suits, sequined hoods reminiscent of the hood worn by the Abu Ghraib torture victim in the iconic photo that made the cover of the Economist, and reenacted snatches of mostly American horror and war genre movies, such as The Shining, Jarhead, The Hills Have Eyes, and Apocalypse Now, into microphones that were not plugged in. 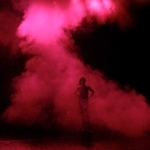 Gas – a large jet of smoke lit pink is directed to the audience. As it clears, a dancer in a sequined, hooded flight suits attempts to embody edits from violent video sequences. Zombies – the ensembled sheds the flight suits to reveal gimp mask latex swimsuits. They first film each other, then pick a victim and club the victim to death. Showg*rls – using choreography copied from music videos and Blackwater videos, the ensemble dons Las Vegas showgirl headresses and performs to a serial killer text. Real Time Film – the cannibal story reappears as enacted in a Real Time Film sequence of the cannibal meeting his victim in his house, and then moving into an Eden-like garden and discussing their meeting and negotiating the act they mutually want to accomplish. 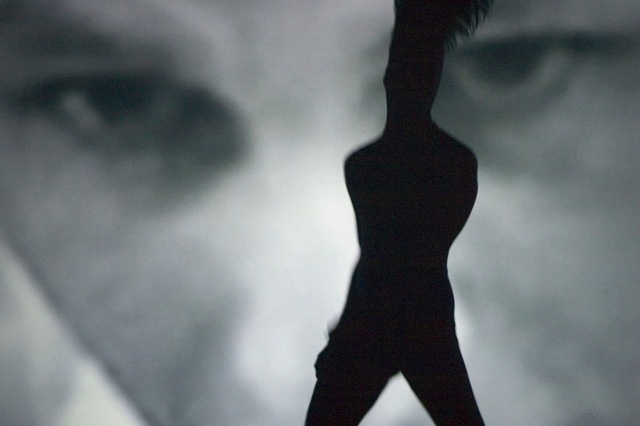 Real Time Film is a hybrid of moving image and theatre in which actors recombined formal ideas of performance through the use of simultaneous presence on stage and for live video using complex task based choreography, digital puppeteering, and cinematic framing. Text is rearranged from Walt Whitman, and Edward Prime Stevenson’s Imre: A Memorandum. Based on actual events, the cannibal story represents the fulfillment of a desire made possible by contemporary technology (chat rooms). The actual event presented a legal quandary for its government, since the act was mutually consensual and there were no laws preventing its consummation. Void – a 10-meter black bag inflates in the stage space to the sound of extreme noise. It pushes against the first row of the audience. There is no curtain call, and the actors do not appear again on stage. Co-produced by Hebbel Am Ufer, Berlin; Festival d’Automne à Paris; Le Studio/Maison des Arts de Créteil; The Wexner Center for the Arts, Columbus; Künstlerhaus Mousonturm, Frankfurt; and The Kitchen; and received funding support from Florence Gould Foundation and étant donnés: The French-American Fund for the Performing Arts.